The Italianate style farmhouse was built in 1884 by Marcus Sears Bell, an early developer in new Richmond. He gave up his post as village president when he moved outside of the village to breed prize-winning cattle at this farm. In 1910 the Tierney family (pictured) purchased the 360 acre farm and worked the land until 1982. The farmhouse, barn and granary are original to this farm. Additional buildings have been moved here. They represent life and building styles from earlier times. The center is owned and operated by the New Richmond Preservation Society, Inc. This is one of many interpretive signs in the Rivers, Rails & Trails Heritage Area, a project funded in part by a Heritage Tourism grant from the Wisconsin Department of Tourism. 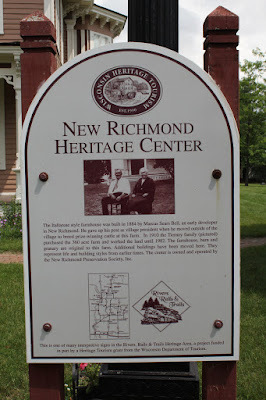 The marker is located at the New Richmond Heritage Center at 1100 Heritage Drive, New Richmond, Wisconsin 54017. Click here to view all markers located at the New Richmond Heritage Center. (visible at the center of the photo, in front of the street lamp).